Historian Robert Zaretsky follows up his delightful 2015 book Boswell’s Enlightenment with another compact, intensely readable account of a chatty, friendly literary genius interacting in large part with a somewhat unguessable larger-than-life planetary body. And in Catherine & Diderot, the scaling has increased on both sides of the equation: in place of the furtive, slightly squirrelly James Boswell and his eager notebook, we have the celebrated French philosopher Denis Diderot, famous atheist, polymath, and creator of the famous Encyclopédie, somebody who thought more and deeper by the time he was 18 than Boswell bothered to think in his entire life; and in the place of Doctor Johnson, the enormous uncouth and violently brilliant planet Jupiter, we have no less than Catherine the Great, the resplendent and utterly compelling planet Saturn, turning all of vast Russia and all of a wary, awestruck Europe in her gravitational wake. It’s one of history’s signature odd pairings, the absolute ruler of a vast, brooding country and the disreputable iconoclast who’d already been arrested decades earlier by his own country. Throughout his life, Diderot’s finances had always been wrenchingly precarious, and at one point he was driven to the last measure of the desperate intellectual: selling off his personal library. Word reached Catherine in Saint Petersburg, and she acted: she bought the library and appointed Diderot as its well-salaried librarian. As soon as Catherine had bought his library, Diderot understood that she had also bought, if not him, at least his nonrefundable ticket to Saint Petersburg. That he would have to go one day was clear; less clear was how he should act once there. “How can Denis le philosophe,” he wondered, “deserve to be called a collaborator of Catherine’s? How might he also work for the happiness of the people?” There was little modesty in these repeated self-interrogations, and why should there be? Why indeed. The dozens of meetings Diderot ended up having with Catherine come off as serio-comic, even in Zaretsky’s gimlet-eyed by sympathetic summaries. 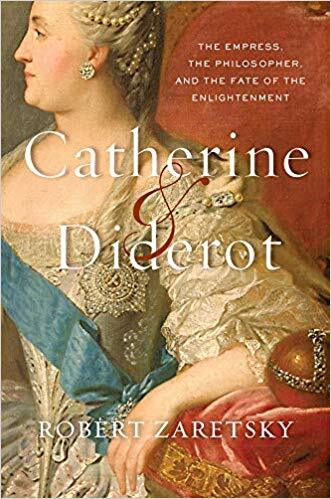 Catherine was an encouraging listener but never dropped the facade of wry reserve that made her so fascinating, and Diderot never seemed to notice this fact, so caught up was he in the theatrics of his own perorations. He talked endlessly, he gesticulated, he unthinkingly jabbed Catherine’s leg for emphasis whenever some point struck him as particularly salient (since almost all of his points struck him that way, she eventually resorted to positioning and end table between them). We tend to think of the great thinkers as isolated and imperious individuals who sacrifice the life of everyday duties and pleasures in the pursuit of ideas and ideals. Yet Diderot collapses this stereotype: his character combined heart-stopping originality with heart-warming congeniality. He was fully engaged in the political and social issues of his day, but at the same time remained fully engaged in the lives of his friends, family, and (yes) mistresses. Readers of Catherine & Diderot won’t have much trouble picking out the real mensch in the story, but as a glimpse at a very odd meeting of the minds, this little account could scarcely be bettered.